Cain Velasquez vs Junior dos Santos 3 is the UFC 66 main event held on October 19, 2013 at Toyota Center, Houston, Texas, USA for heavyweight division. If you could see the video replay highlights of Velasquez vs Dos Santos 3, you will the all action packed by this heavyweights in the UFC history. This is their 3rd encounter and probably the last encounter where Velasquez wins. In their first fight, Dos Santos TKO'ed Velasquez in the first round. In the second fight, Velasquez wins via unanimous decision after 5 rounds. But this time, their 3rd and final fight, Velasquez defeated Dos Santos via TKO on round 5. In round 5, Velasquez lands a left hook early and takes Dos Santos down. Dos Santos gets up but Velasquez clinches again and lands punches up against the cage. Dos Santos drops down, hits his head against the mat, eats a couple punches, and referee Herb Dean stops the bout. That was a savage beatdown. It was a spectacular match up and impressive win by Cain Velasquez who said to be the first man to badly dismantled Junior Dos Santos. Kudos to Cain Velasquez, congratulations! You may watch the video replay highlights of the fight. Note:( This video is a free embeddable video hosted on Vk.com. It was not uploaded by PinoyThinking site, to report it please visit the link where it is hosted. Thanks! 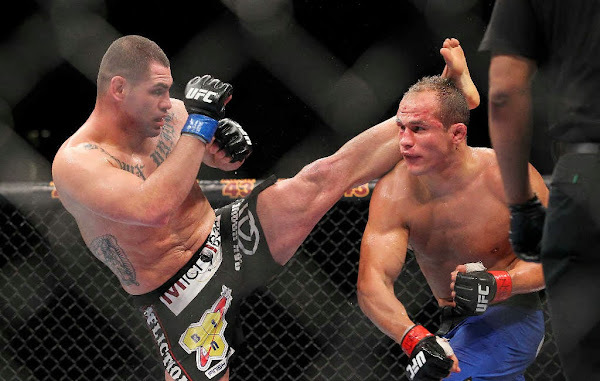 Cain Ramirez Velasquez is an American mixed martial artist fighting in the Ultimate Fighting Championship where he is a two-time and current UFC Heavyweight Champion. He is currently ranked the No. 1 heavyweight in the world by Sherdog. I hope you enjoy watching the video replay highlights of Cain Velasquez vs Junior dos Santos 3 UFC 166 and till next installment for MMA fighting championship.